We couldn't forget about Amie's teachers on Easter! I used my Art Philosophy Cricut cartridge (again!) to cut out 3 different coloured egg cards and eggs with flower cut outs, which I mixed and matched. 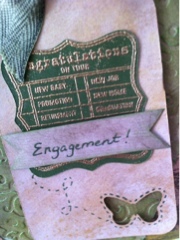 I embossed the egg die cut with the Cuttlebug and used Distress Ink to highlight the embossed areas. I chose some ribbons and rickrack to embellish the front of each egg and added a paper flower, flower brad and gem to the centre of each. Happy Easter To My Peeps and Easter Tag! It's just a few days before Easter now, the cards have been made and mailed, chocolate has been stashed and treat bags have been filled with goodies for Amie's classmates. I had a cute stamp set I got last year from Close To My Heart and never got to use, so I pulled it out and used a technique from the Pattern Play Class, Day 2 - stamping on patterned paper. I stamped a chevron stamp with versamark on some polkadot paper from a baby paper pad I had and used clear embossing powder to create a resist. Then I sponged Distress Inks over top to color the background. I used another page from the same paper pack across the top of the card and stamped Easter eggs on the back of that paper, colouring part of it in with Tombow markers. I stamped 3 Peeps bunnies on yellow paper by creating a mask for the centre bunny and then stamping another one on each side. I brushed Clear Rock Candy Distress Stickles over top to create a sugary look. 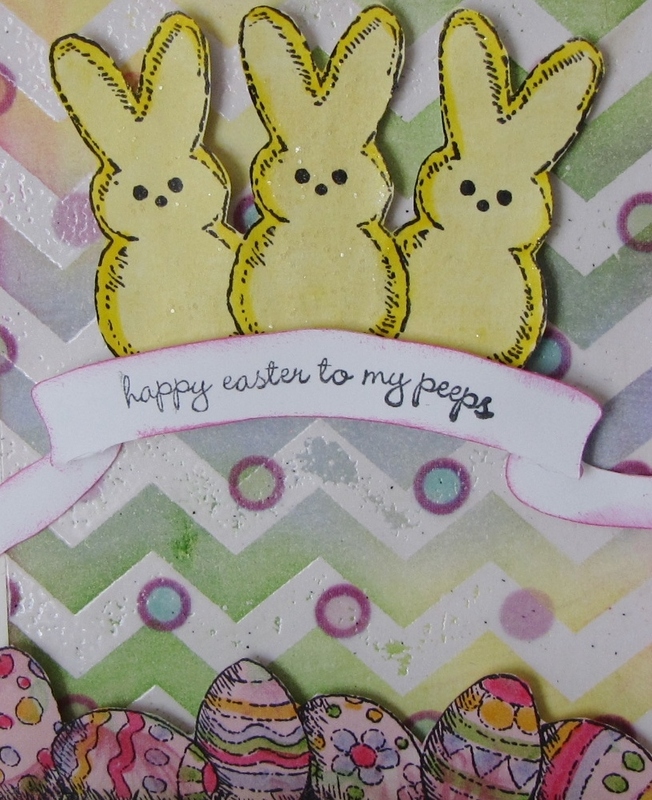 I cut out the bunnies and eggs and popped them up with foam tape and then put on the banner I cut from the Heritage Cricut cartridge after stamping with the sentiment "Happy Easter To All My Peeps". I used a yellow marker to highlight the edge of the bunnies. The background of the eggs was pink flowers so all I had to do was color in some of the details. The treat bags for Amie's class - I made a tag to include with each bag by cutting an egg shape from the Art Philosophy Cricut cartridge out of patterned paper and stamping on top of it before gluing it to a tag shape. I colored in the word Happy with a blue marker and used Stickles on the chevron pattern, which is a Technique Tuesday stamp. I recently bought sticker labels from Vistaprint with "From Your Friend, Amie" printed on them, which I stuck to the back of each tag. Hope everyone has a wonderful, happy Easter! 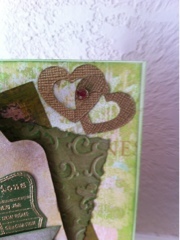 I'm really liking this pattern class at Online Card Classes! I've been watching the videos and reading the lessons all week and sneaking some time in to create the cards whenever I can. I really like the lifetime access to the class and for $16 there is no way I could get this much instruction from a regular class! The first card I made today was again from Kristina Werner and showed a basic use of pattern paper by combining a large pattern, a smaller pattern and a solid or tone on tone. I cut the scalloped circles out with the Cricut Art Philosophy cartridge and used a stamp from CTMH and popped them up with foam tape. I cut 1/2" off the right side of the card and added the scalloped border and then tied some bakers twine around the length of the card. I find it helpful to cut a tiny slit in the top and bottom of the card for the twine to catch in so it's not slipping off the card. 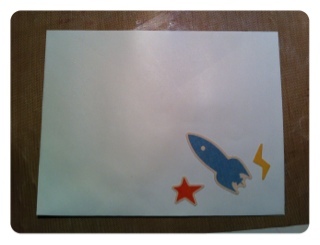 For the second card I made I again used the new 6x6 Hopscotch paper pad I bought. I added an orange polkadot piece across my card with a scalloped edge which wasn't in the class, but after somehow being unable to cut a circle in my bottom layer of paper twice, probably due to having a squirmy toddler on my lap while making this card, I decided to improvise! 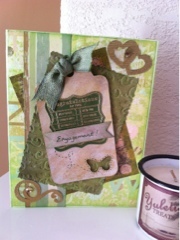 I used Distress Ink on both circle layers and cut out 'For You' from my Gypsy Wanderings cartridge. I used a Prismacolor marker to go over the words, which were cut from patterned paper, to make them stand out better. These were both pretty quick cards to put together and could really be used for any occasion just by changing the paper and sentiment. Have a great weekend! It's my beautiful sister, Jann's birthday this week and of course I needed to make her an awesome card! I recently picked up the February 2013 issue of a UK magazine Craft Stamper with some beautiful card ideas in it, and it came with a butterfly stamp included from Darkroom Door and then a bunch of ideas for using the stamp. I just loved this card and thought it turned out quite close to how it was pictured. I stamped off the ink once before stamping onto the background to get a much lighter impression and then blended my Distress Inks over each layer. For the very top butterfly layer I stamped and cut an extra butterfly and attached it with foam tape to give it dimension and then covered it with Glossy Accents. I also wanted to share a Kobo Touch case I made as a gift for her. I got the pattern from the Quilt Knit Run Sew blog. This is the second one I've made and I'm so pleased with how well it turned out and how easy it was to whip up! I sewed on a piece of fabric and button hole/button to keep it closed. Hope you all have a fabulous weekend with lots of creative inspiration! I must say I really like this set of cards that Jennifer McGuire made on day 1 of the Pattern Play class at Online Card Classes! I picked up a 6x6 paper pad yesterday and I'm feeling like this could be a new addiction! It is just so easy to put together papers for cards with a paper pack, and with the 6x6 the patterns are smaller than the larger 12x12 packs - perfect for cards! For this set of cards I again used my Gypsy and cut out 3 inner hearts (from the George Cricut cartridge) each from four 4 3/4" pieces of patterned paper. After everything was cut I could then switch the pieces up and end up with four similar, but different cards. I also used the Heritage cartridge to cut four banners and by using clear stamps I was able to manipulate them into a curve to fit the banner. I used a 30% cool grey Prismacolor marker to outline the banner and make some shadow lines in the fold area and used foam tape to give it dimension on the card. After the pieces were cut I mixed and matched till I got combinations I was happy with. 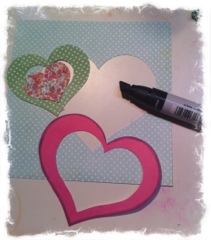 I cut out 3 white hearts, slightly larger than the patterned hearts and layered them one on top of the other. 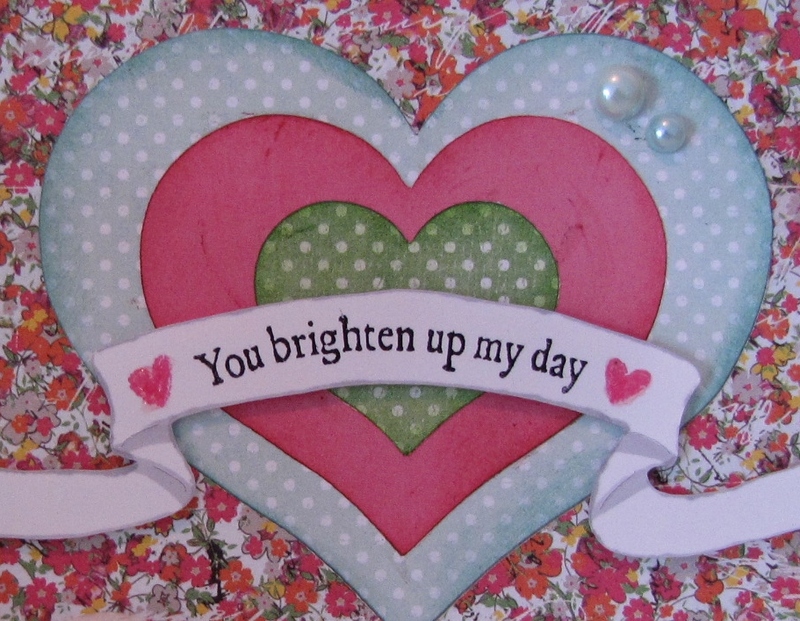 I sponged Distress Inks around the edges of each heart to give them definition and then layered them onto the card. I put white cardstock underneath the hearts and popped them each up on this card. I think this one's my favorite! I traced around each heart with a Prismacolor marker in 30% cool grey and layered them on the card. I realized I had placed the paper slightly off center when I cut it so I put some flower rickrack on the left side. 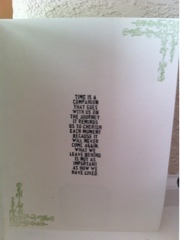 Inside I stamped "for you". I think you could use these cards for most any occasion just by stamping the insde with the appropriate sentiment. I'm thinking they will probably be birthday cards. Which one is your favorite?! 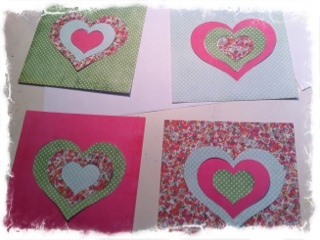 I'm taking a wonderful new class over at Online Card Classes - Pattern Play. It is a class with Jennifer McGuire and Kristina Werner and many more fabulous people to show you some great techniques for combining patterned paper and making some amazing cards. If you haven't checked out all the wonderful classes at Online Card classes it is well worth having a look! My card is based on a card Kristina made on Day 1. I actually used the Cricut and my Gypsy and spaced three 1"circles about a 1/2" apart, and placed a piece of 2 1/2" wide patterned cardstock on the mat, centred over the area where the circles would cut. 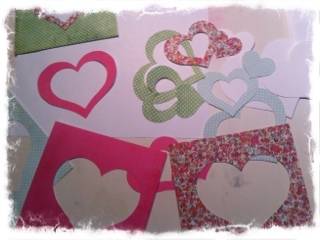 I also cut 2 more circles a bit larger in yellow and striped and a small heart. I then used foam dots to pop up the cardstock with the circles cut out after embossing an 'S' for Stephanie (it's her birthday this month!) on the top circle and gluing the yellow and striped cardstock down. I placed a piece of green floral paper beside this and used a white gel pen to make stitching lines down each side. Lastly I tied a piece of twine around the floral paper and rounded the corners. Here in Calgary we were teased with a week or so of nice weather and now we are back to snow and mornings of -23 temperatures with the windchill. Bleck! Amie, my 6 year old, and I decided to have a crafty day yesterday and I was wishing for summer - or at least spring! So I decided to make a summertime frame for Amie's room. I used a dollar wooden frame from Michaels and Mod Podged some yellow Cosmo Cricket paper onto the front. I used Broken China distress ink around the edges and right on the wood sides of the frame. 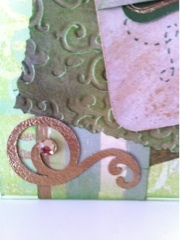 I then layered embellishments, stickers and rub-ons from Pink Paisley in a summer theme inside and on top of the frame. 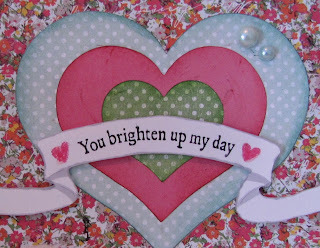 I used some yellow Stickles brushed over the sun and stamped a sentiment from CTMH Treasures stamp set. I used a banner stamp on Kraft cardstock, which I coloured with Tombow markers and cut out before gluing onto the picture. Amie has a friend's birthday coming up and wanted to make him a birthday poster. 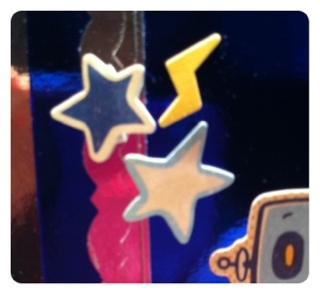 She chose shiny blue paper and rocket stickers and then added blobs of a white paint pen, which she wiped with a tissue to create a shooting star effect. She also used gel pens to add details and an Amy Tangerine date stamp as well as stamping with a banner stamp coloured with Tombows! I'm entering this post into a Design Team call at the Our Crafty Girls blog. Having 3 girls spanning from 1 to almost 25 means everyone is going through a different stage of their life. My youngest is walking and just learning to sound out words and has realized screaming is an effective way to let her 6 year old sister know that she's bugging her. My 6 year old is loving kindergarten, meeting new friends and trying to test the limits of her parents' authority. And my beautiful 24 year old has just announced she's engaged! We are going out to supper with her and her fiancé and his parents next weekend so I wanted to get a card made for them. 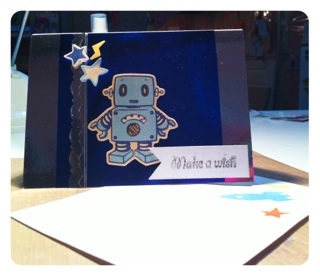 I decided to use this week's sketch #2 from Simon Says Challenge Blog as the basis for the card. I die cut a butterfly tag from the Art Philosophy Cricut cartridge, my favourite cart, and first rubbed it into pools of Tim Holtz Distress stain, one of my fav products, and then spritzed it with gold mist. I layered it over a piece of cardstock, first coloured with green Distress Stain and then embossed with my Cuttlebug - a favourite tool! I cut out two hearts, a scroll and a square shape with the Cricut, another fav tool, and the Art Philosophy cart and used gold embossing powder on the scroll and square and a gold pen on the hearts. Added a couple gems for bling and used a Tim Holtz stamp (fav!) on the inside. I hope Steph and her fiancé will like the card, but more importantly I hope they will have many, many happy years together! Scrapbooker's Paradise - use your favourite products. See mine listed above! Once your kids start school there is a definite increase in birthday party invites! I think I may need to keep a stock of boy and girl toys from Costco on hand and start having a bunch of cards made ahead of time! Amie was invited to the 4 Cats Art Studio for a little boy's party. They have very cool parties there, but you definitely have to wear clothes that are ok to have paint splatters on. We wore the same clothes from the last party there - and now yellow joins the pink and purple splatters from the last visit! 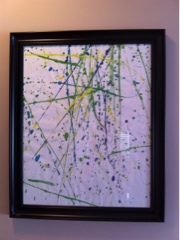 We actually framed the splatter art poster from last time and hung it up on the wall. 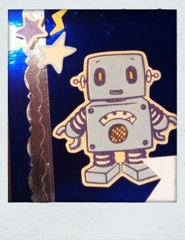 Of course, having 3 girls means I have more pink, flowery paper and embellishments on hand than boy stuff, but I pulled out some shiny silver and blue cardstock and used some stickers from the Rocket Age 12x12 shape stickers page by October Afternoon. 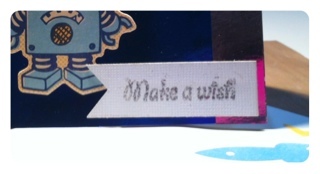 I embossed a 'Make A Wish' sentiment with Silver Tinsel embossing powder on a hand cut banner and followed a sketch from this week's challenge at the Scrapbookers Paradise blog and Amie was all set! Lucky Green & Recent Wins! !